I know Lior, Elad and Ilan, a.k.a. Practical Agile, for a while now. I had the opportunity to speak in the Agile users group they organize (and attends sessions) and also to speak on last year's conference. There were also workshops and other activities, including the unforgettable Coach Retreat Tel Aviv with Yves Hanoulle. 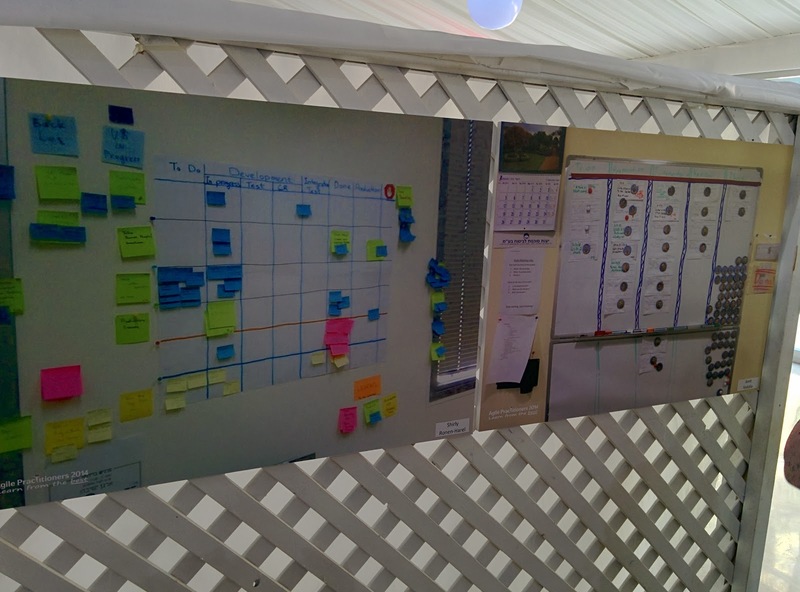 This year's Agile Practitioners conference had 3 tracks to choose sessions from, other than the key notes. The venue was a good match to the needs. I liked the exhibition of team boards arranged by Amit Yedidia. I also liked the feedback green boxes and the feedback notes: they were small enough to make you give short comments, and it was phrased to get positive comments and things to improve. Jutta Eckstein gave the opening keynote, "Towards a learning organization". 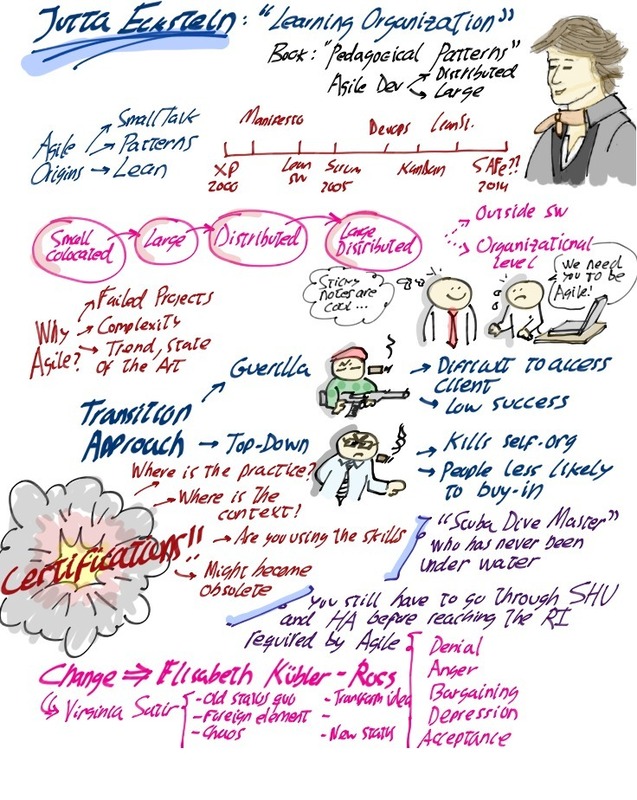 She started with her view on the origins of agile: Toyota, the SmallTalk community and Patterns (architecture and process) and identified a shift in application focus from smaller teams to larger and distributed organizations, and extending outside software development over time. Different adoption strategies hold different risks. Specifically, top-down approaches tend to rely on certifications, which may ensure some knowledge but come short on developing skills, performance and the mindset of continuous learning. Think of a diving master who'd be allowed to guide before ever getting wet. A better option is to follow the famous Shu-Ha-Ri approach as coined by Cockburn. What organizations need to understand going agile is that it is a cultural change. HR can support this change as a personal development initiative towards more personal responsibility. Performance evaluation and MBO plans will need to change to prefer team achievement over personal goals. Managers need to serve as role models for learning, for allowing failures and admitting their own mistakes. See also: cool sketch of this talk by Angel Medinilla. 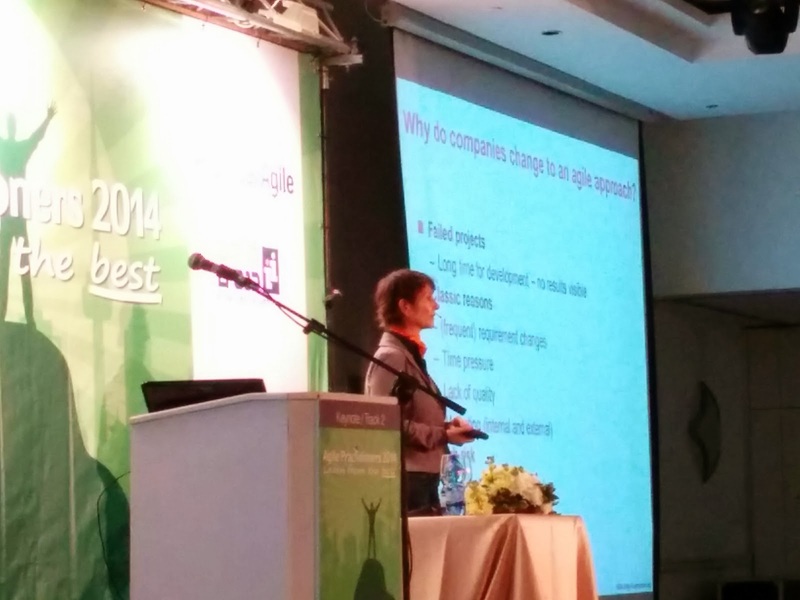 Next I attended Naama Gafni Lifshitz who shared her insights about hosting Project Retrospectives. She had a bunch of very useful, practical tips and structure. Great stuff on how to prepare, who to open, gather input in groups, cluster it all (with pre-thought-of color coding!) and prioritize, investigate for root causes and potential solutions and how to wrap it all up. Look for the slides once they are public if you plan for such a retro to get the tips - and pitfalls to beware of. Angel Medinilla (@angel_m) gave a funny and energetic session, identifying the limited amount of guidance scrum masters have regarding their role and offering help with a few archetypes: the go-through-the-motions "Scrum Dude", the over protective "Scrum Mom", and "Yoda" the facilitator, true scrum master, who grows the team, teaches how to deal with conflict and delegates progressively (self organization is not a boolean attribute...). Next comes the hypothetical "Agile Nirvana", the scrum master who inspires agility by his/her very presence. To be effective, the scrum master needs to be one step ahead of the team on this continuum - the delegation oriented Yoda will get blank stares from the beginner team who's used to the Dude. Get them a Mom. To develop great scrum master, you'll need to acknowledge they need to combine technical understanding, human skills and agile knowledge. based on the current skills, invest in learning to get a balanced mix of capabilities. 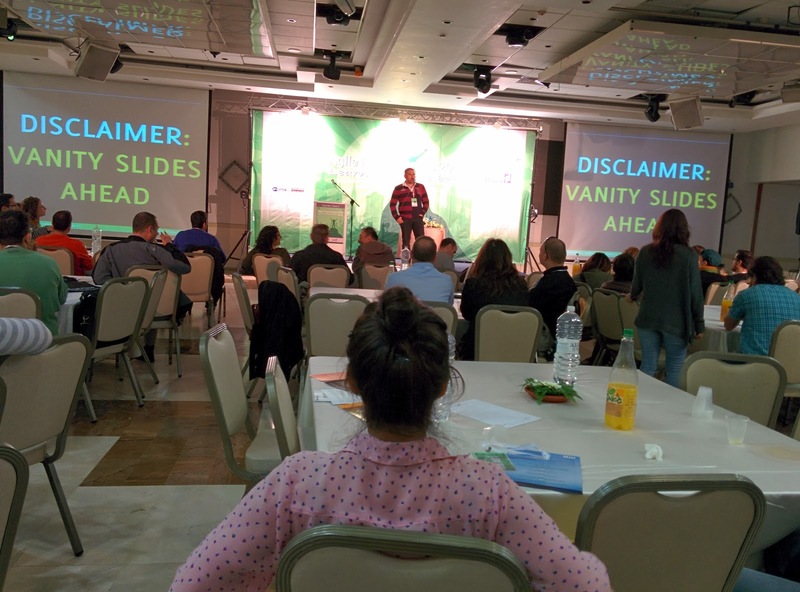 Avi Naparstek, Shirly Harel Ronen and Dan Kuida hosted a card game, which was aimed to get the players familiar with various agile practices and which problems they can address. The short session wasn't enough to get the full set of rules across, so playing was somewhat chaotic - but at least some of the concepts came across nicely and the atmosphere was playful. The cards were beautifully designed and executed, and with more time I'm sure the game can come in as a fun and useful educational experience. Here's a full report of it with many more details by Avi. Uri's talk focused on efficiency vs. effectiveness, against the old-school management concept of maximizing utilization and "correct" assignment per expertise. Focus on results, on delivery, on velocity. Another management pattern to avoid is making KPIs the goal. KPIs are useful indicators, but they must come with human judgement and feeling. Can't truly measure some things such as productivity or technical debt. Here are the slides. Oren shared some insights and ideas he came up with after taking on a management role. I liked many of the ideas - applying a system of "code review" to management decisions, how to welcome new employees in a personal memorable way, how to recognize team members, how to embrace simplicity and how not to let HR have all the fun congratulating people for birthdays and such, taking out the personal connection. I loved that he called it "stop outsourcing your emotions". Angel did such a great job with the sketch I really have nothing to add: Another great sketch by Angel Medinilla. As there were three tracks I know I missed some great talks, but that's life. Again, another great conference, and I've yet to write of the other events that came along with this. Well done, folks!